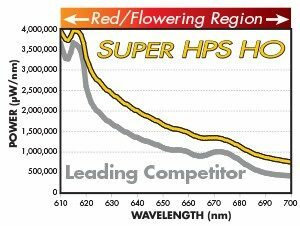 Engineered to deliver the highest µ-mol (micro-mol) of any single-ended lamp on the market today, this lamp produces 20% more useable photons when compared side-by side with top industry brands. The lamp chemistry is geared to support aggressive flowering, having 47% more red energy (620-750nm). Early field tests are producing very promising feedback . . . . “We recognized 9% higher yields in a controlled test, comparing this lamp to (leading brand). 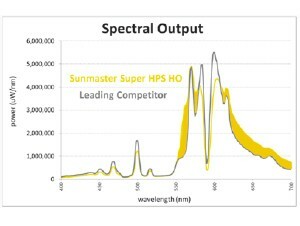 We will convert 100% of our 1000W systems over to Sunmaster Super HO” – commercial grower, MI. Product is expected to be available in October.